DOS Home > Museum Home > Exhibitions > Current Exhibitions: Jersey Crocs Rule! The exhibition will allow visitors to explore the existence of crocodiles in New Jersey throughout their evolution. The wide diversity of crocodile species found in the Garden State’s fossil record is often a source of amazement to those who think of these creatures as surviving only in tropical and subtropical climates. The exhibition will feature taxidermy mounts and skeletons of crocodiles of prehistoric and living species. Visitors will be amazed by the six foot long cast of the skull of New Jersey native Deinosuchus, one of the world’s largest known crocodiles. Crocodylians have been on the Earth for over 200 million years. Much of their evolutionary history is documented in the fossils and rocks found in New Jersey. Crocodiles, alligators and gharials from the State Museum’s collections illustrate the modern form, while the exhibit also delves into the fossil history of crocs in New Jersey, beginning with preserved croc-like trackways dating back almost 200 million years. One remarkable fossil feature of the exhibit will be a nearly complete skeleton of crocodylian Hyposaurus rogersii, which lived in what is now Gloucester County, NJ about 65 million years ago. Visitors will also come face-to-face with a skull reconstruction of Deinosuchus, one of the largest crocodiles to ever live. Other features of the exhibit will include interactives demonstrating how croc tails move and what their prehistoric environments were like, specimens of at least 5 different types of crocodylians that once lived in New Jersey, and a display of a recent croc fossil discovery currently under preparation at the State Museum. 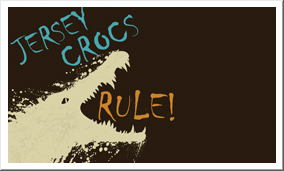 “Jersey Crocs Rule!” is supported in part by the New Jersey State Museum Foundation and will be on view through September 8, 2019.